Today I am starting a whole new chapter in my blogging life as a design team member at Diane's Daydream Designs. I have seen all the beautiful artwork of crafters who color in digi designs, but never had enough time or patience or confidence that I could make digis look that good. But Diane has pre-colored digis as well as ones you may color in to your liking. Sounds great to me! :o) She also has lovely background papers and wonderful sentiments. I do hope you will go to Diane's store and check out all of her wonderful sentiments and artwork. Her products are delightful and so reasonably priced. Poppies always make such a lovely statement no matter what the occasion or reason. 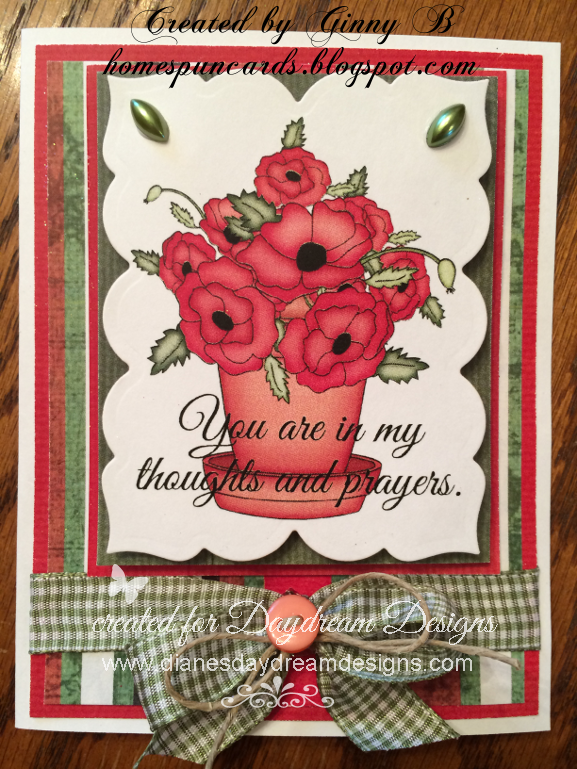 THanks for sharing this on the Craft-Dee BowZ July challenge! Fabulous card! The digi image is beautiful and I love the you used a die-cut around it. Thanks for joining the Craft-Dee BowZ July Challenge. You've done a lovely job with your Daydream Designs images, and you will be a tremendous blessing to the Design Team for sure! Diane is blessed to have you. Thanks SO MUCH for sharing this gorgeous card in our challenge this week. Have a blessed week. Beautiful card. Love the matting focusing attention on the lovely image you've colored. Beautifully coordinated card.Everything works perfectly and just love the gingham and twine bow.Thanks for joining us at Craft Your Passion.Hope to see you again next week. Beautiful card, Thank you for sharing with us over at a Girl who Crafts. Such a lovely card with so much meaning. I love the main image and the papers you have used.